At PC Medic, no booking is required. For computer repairs, including Windows Laptops, Apple Macbook Pro, iPads and more, in Melbourne or surrounding suburbs such asSt Kilda, Port Melbourne, Albert Park, Fitzroy, North Melbourne, Collingwood and beyond, our St Kilda or Ringwood service centre is your closest PC Medic. Priority service is free, we don't charge more for same day to next day service. We always aim to repair your laptop in the time you specify. Often, same day service is possible. No Obligation Quotes No Fix No Fee. No Obligation Quotes. We have a physical Retail Service Centre so no waiting for onsite techs. Get a Premium Service in our Service Centre rather than a typical competitors brief onsite visit. Come and say hi to us at our Ringwood Repair Centre. You'll be amazed by our first class Service Centre. Fast check turnaround for Apple Macbook, iMac and Microsoft PC's. Data Recovery onsite performed for faulty HDD's, USB HDD recovery and more. We'll go all out to recover your photos and important files. Fast Turn Around Ask us for Priority and one of our Techs will be dedicated to managing your service. Awesome speedy service is available in our Service Centres. When you book in, give us your timeframe so we provide you with a speedy service. The PC Medic Safe and Reliable Guarantee. Backed by an amazing warranty on all parts and labour. Your laptop or notebook computer will be in safe hands with PC Medic, Apple, PC or a Google Chromebook. We can fix it! Service Centres in Ringwood and St Kilda, Melbourne. We love the good old desktop computer. They are robust and fast to repair. PC Medic can repair your desktop or tower PC fast. Windows or Apple, both can get viruses and PC Medic is ready perform removal or any Virus or Spyware infection. Macbook Pro and iMac Data Recovery. Apple iPad data recovery for when you've damaged your iPad and Cracked the Screen or display. iPhone Data Recovery where your phone will not turn on, is damaged from a drop or liquid spill. 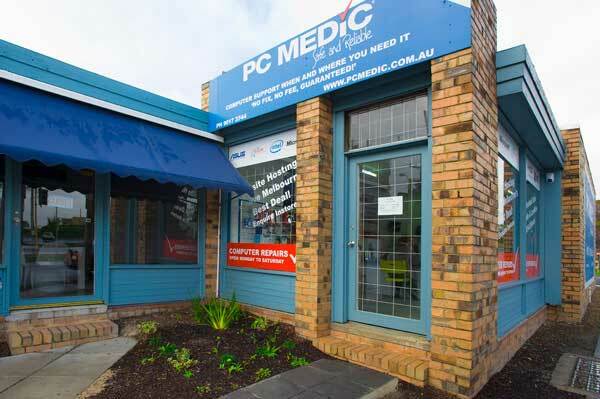 PC Medic are the professionals at Data Recovery from PC & Laptops, Apple or Windows, ipads or phones, USB Flash drives and USB External Hard Disk Drives. Photo Data Recovery, Document Data Recovery and more. PC Medic in Ringwood. Data Recovery, Apple Repairs, PC Laptop Repairs & Photo Recovery. No booking required. Lots of parking. Train / Bus station & Eastland Shopping Centre only 200 meters away. Once the quote is accepted, we promptly complete the service. We'll contact you for collection. Credit Cards or Cash accepted.